Could Plastic Bottles Made by Ancient Americans be the Cause of their Health Decline? According to Wired, scientists believe that ancient Native Americans living in California made their own plastic water bottles. However, they probably didn’t know how toxic the manufacturing process of these bottles may have been for their health. In a recent study published in the journal Environmental Health a few days ago, scientists attempt to find out if bitumen, a material derived from petroleum, could have had a negative impact on the health of ancient Native Americans who lived in California. Bitumen consists of polycyclic aromatic hydrocarbons (PAHs), which are linked with a variety of health problems including cancer, hormone imbalance, organ damage and developmental impairments. The various health effects of PAHs on modern humans who are exposed to them through smoking tobacco, burning of fossil fuels and food processing among other modern activities, are well documented, but their health impacts on ancient people are not as clear. It has previously been proposed that a prehistoric health decline among the native people living on the California Channel Islands may have been related to PAH exposure but so far there has been no clear scientific proof verifying this suggestion. 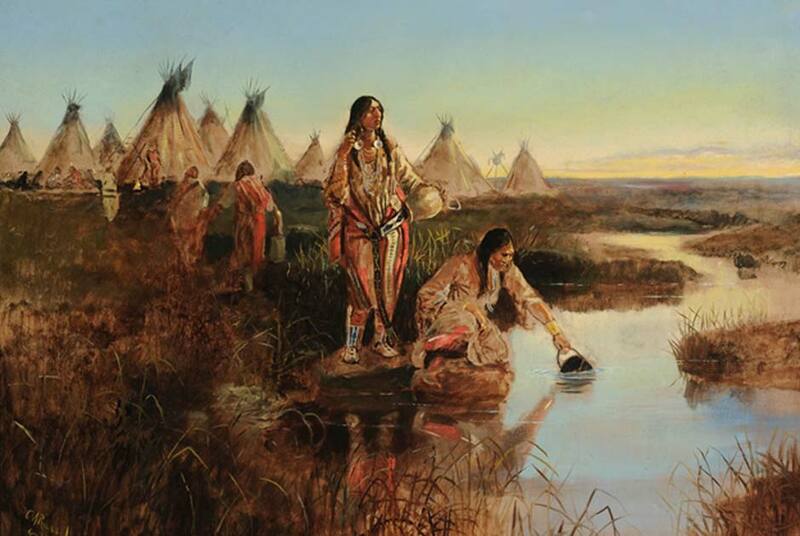 According to archaeological evidence and ethno-historical records, Native Californian Indians undoubtedly used bitumen for a variety of purposes such as a burning material for producing smoke signals, making plastic water bottles and fixing arrowheads. For that matter, scientists have known for years about these pitch-black plastic bottles created by Native American tribes. What they didn’t know but recently discovered, is that these plastic bottles could have possibly damaged their health, as the examination of their ancient skeletal remains shows that they suffered a health decline over time. The scientists who took part in the study created two types of ancient water bottle using traditional Californian Indian methods. 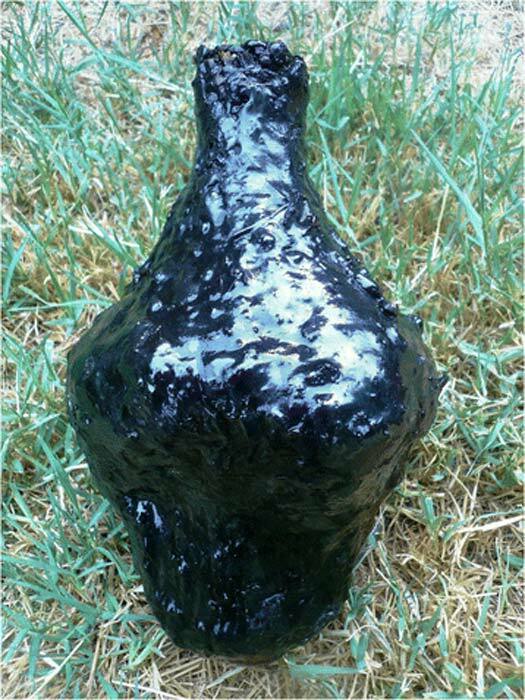 One of the bottles was lined with soft bitumen, known as 'malak', which washes ashore after seeping through the ocean floor, and one was lined with hard bitumen, known as 'woqo', usually found in land deposits. Kevin Smith, co-author and PhD student from the University of California tells Science Daily about the recreation of the bottles: "In accordance with historical records we used a Monterey chert flake and a bird bone awl to weave baskets from soft rush plants from California. We sourced abalone shells to use as mixing dish and heated the bitumen with metavolcanic pebbles before applying to the basket by hand using a sea mammal bone." Interestingly, the air sampling showed that the smoke produced while creating one of these plastic bottles had a much higher concentration of toxins than cigarettes. Why was Ancient Middle Eastern Bitumen Discovered in an Anglo-Saxon Boat Burial at Sutton Hoo, England? Transferring water in plastic bottles or through pipes has always been a difficult thing. Dr. Sabrina Sholts, lead author of the study from the Smithsonian Institution's National Museum of Natural History, believes that the bitumen those Native Californians used to make their bottles didn't leak enough chemicals into their water to cause them such health problems as the skeletons showed. Possibly, for the ones who made those bottles, there was a negative effect to their health, even though Sholts believes that they weren't producing bottles regularly enough to accumulate dangerous levels of the toxins in their bodies. However, she doesn’t eliminate any theory, due to the fact that the study wasn’t as detailed as she would have liked, "It’s hard to say how much of any chemical exposure would induce health problems. It's dependent on dose, duration, and when in the person's life they were exposed," she tells Wired , and adds, "Bones are all I have," implying that toxicologists need more than just bones (such as soft flesh) to determine the toxin levels in a human body. It would have made water taste terrible. They would have realize that it was toxic. The word plastic isl not just a noun. It is also an adjective meaning ""pliable." The study went too far, I thought, in its conclusion, but air pollution settles in the area where the Chumash lived, and burning such substances could have been a contributing factor to declining health. Why don’t you mention their name? They were the Chumash People, and no, their is no proof the bitumen damaged their health. The Spanish explorers said that they were numerous and healthy, and had been using bitumen for their planked boats for hundreds of years before that time. What a dumb useless study! What is the point?! This 'research' is all speculation, otherwise known in the real world as pure fantasy. Read more about To Open or Not to Open The 1,650-Year-Old Speyer Wine Bottle?